Zhang Qianjin hurried away to collect used books as he said politely, “I will be there quickly,” over the telephone, sharply ending our conversation about his dream. Zhang left his hometown in Tongling, East China’s Anhui province for Beijing in 1999, after finishing his middle school education. He spent his first four years putting up advertisement posters on campuses for dotcom and language training companies. That was a period for which he felt proud of himself because he contributed to some companies that later became industry leaders in China, including Chinese portal Sohu.com and English language training school New Oriental. "I helped put posters and banners of Sohu’s commercial campaign in Tsinghua University and made Charles Zhang, chief executive of Sohu.com, famous overnight in the university," he said of his past achievement. Zhang thought his educational background too low to sustain long-term development in advertising, and he also got tired of the fierce competition of pasting the bulletin boards with ad posters. Then he started a second job as a garbage collector and now works as a cleaner at the University of Science and Technology Beijing. Zhang said his current income, mainly through collecting and reselling used water bottles, cartons, old books or newspapers, was not fixed but usually he can save 1,000 yuan each month after all expenses, such as renting a room and smoking. "To collect garbage is also a hard job. I seldom sleep over six hours per day, and usually I buy fast food for a cheap price," he said. 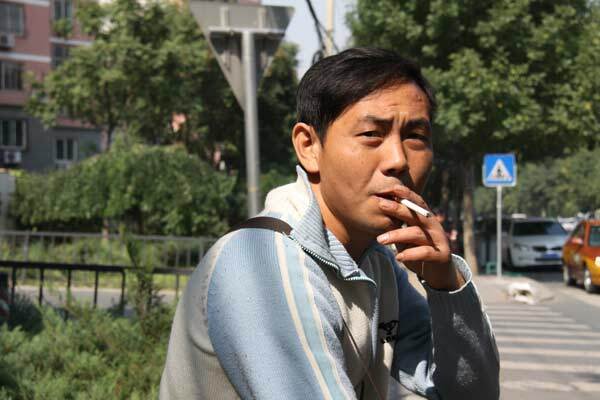 Unlike most collectors who roam around residential communities on tricycles or stay in one spot passively waiting for customers, Zhang is more aggressive in collecting garbage. He printed business cards, which has two mobile phone numbers, and says he can be an hourly worker and a cleaner. In a more unconventional way, he asked his friends to post information on the Internet and plans to establish a website to promote his services. Zhang dreams of having his own garbage dealing station in several years and wants to build a company that can directly process the garbage to make new products, such as boxes or plastic bins. "It will be all-in-one service. I collect garbage, process it, make new products, and sell them. The only problem is that I don’t have enough money, and my networking is very limited," the 29-year-old explained before he hurried away after taking another phone call.